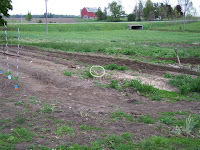 Life by the Creek: Our garden is in!! 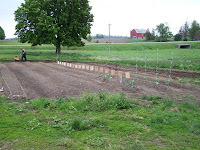 So, on Saturday we got in two rows of Swiss Chard, Tomatoes, Red onions, Spanish onions, Parsnips, Carrots, Radishes, Pak Choi and two MORE rows of corn. 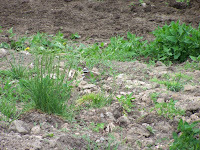 And, we did it all without disturbing the Killdeer nest! Yes, that's right, we went around it. There are a few shorter rows, and the mama was NOT happy with us - especially when Jeff was running the tiller near the nest, but we didn't hurt it. See her? She's back on her nest for the night.